The shipment of boxes in my post of August 22 JUST GOT THERE TODAY! It was a long day with a good deal of distractions but I am getting a message out to you before I bed down. The packages arrived today and once again you have many, many smiles from appreciative Soldiers. The soups and tuna are big hits when we are not able to align schedules with the chow hall. All much appreciated and well received. We are now sitting good on coffee for a month or so, haha. As the weather continues to cool down I’m sure consumption will increase putting what we have to very good use. Tomorrow I will circulate packages around to the other companies like I did before. Comments continue to be a mix of appreciative and amazed that people will take the time and money to think of us. After now being here for a few months this was a welcome morale boost. Thank you again to all who contributed. Thanks again to all of you supporters out there who have lighted up smiling faces in that dangerous part of the world! We still have coffee in inventory left to send so we will hold off on that for a while. Snack items and energy bars and powdered drink mixes will still be greatly appreciated. Beef jerky, nuts, pocketable snack items will be greatly appreciated. Please feel free to use your imagination and think "high density" items that do NOT require sending packages full of "air" in those expensive Flat Rate boxes at $17.40 postage each! Ramen is a lot of "air" but it can be partially crushed to fill in corners of boxes and it is going to become soup anyway. Whatever you care to donate will bring lots of cheer and good memories to these troops. They really are dazzled by these simple things our mountain community are willing to send. Thank you, again, SO MUCH for your support! RidinHy06 - THANK YOU for your generous donation of products for our troops!! You are awesome!! They will go out in the next shipment. TSAC got another 8 APO Flat Rate boxes off to our Army Chinook unit in Afghanistan. 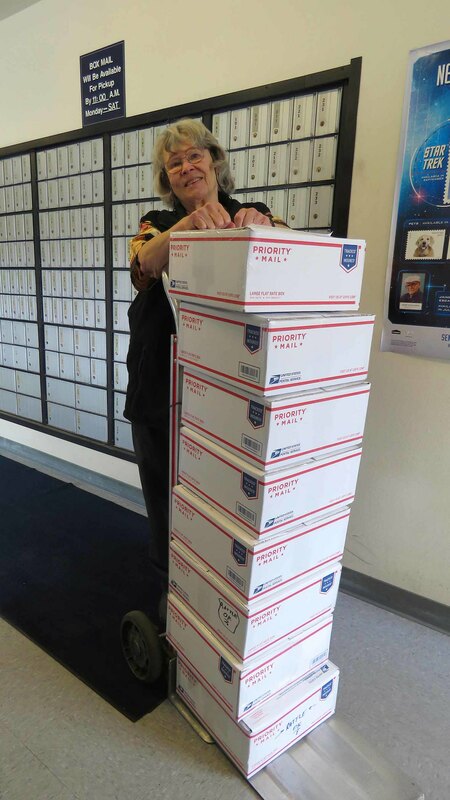 Here is Mrs. BGR, TSAC Secretary, holding up the dolly with all the boxes just before they went into the Bailey Post Office. This shipment totaled 83 pounds and averaged out to $1.68/pound. 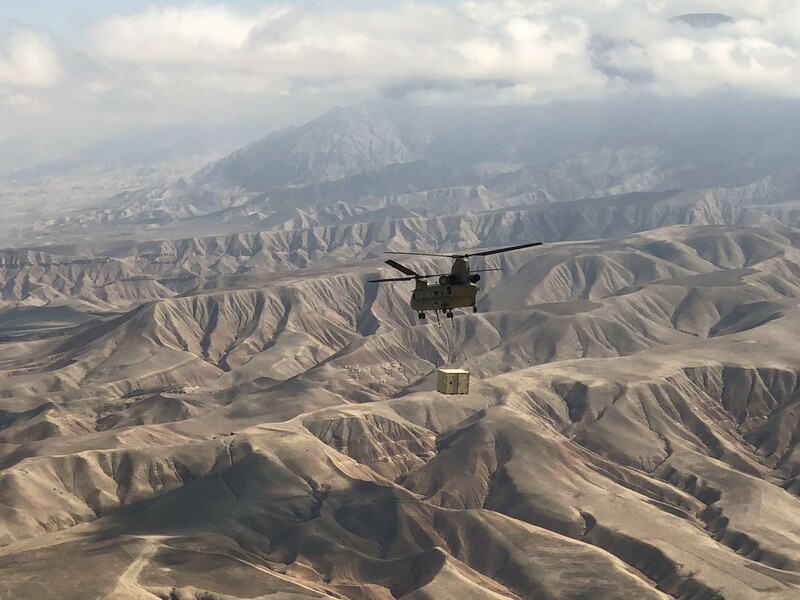 This set of boxes will really light up smiles in Afghanistan when our Chinook guys spread the wealth around to a few remote outlying bases. All of this stuff is a direct result of those of you in our generous mountain community sharing and letting TSAC be the pipeline for what you let us ship! Included in these boxes was tuna lunch snack packets, beef jerky, coffee, ramen, energy bars, fancy flavored coffee creamer, microwave popcorn, trail mix, trail mix, peanuts, fancy mixed nuts, cheese cracker packets, raisin boxes, and powdered drink mix flavorings. 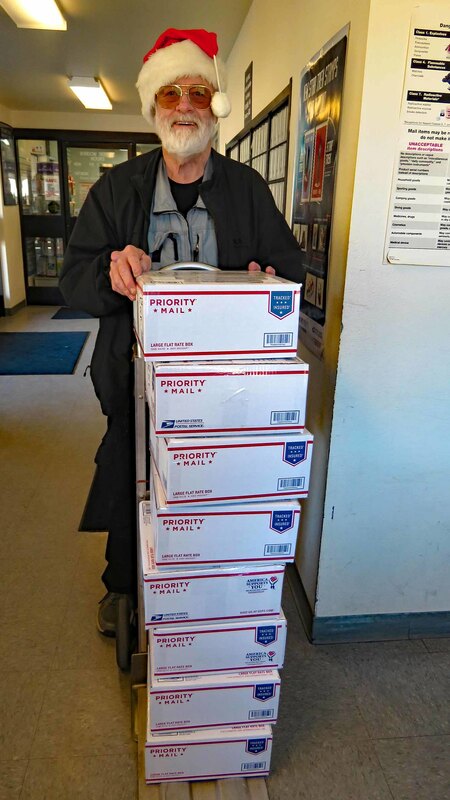 Thank all of you out there and please allow TSAC to continue to send these highly favored items to these troops in a very dangerous part of the world! 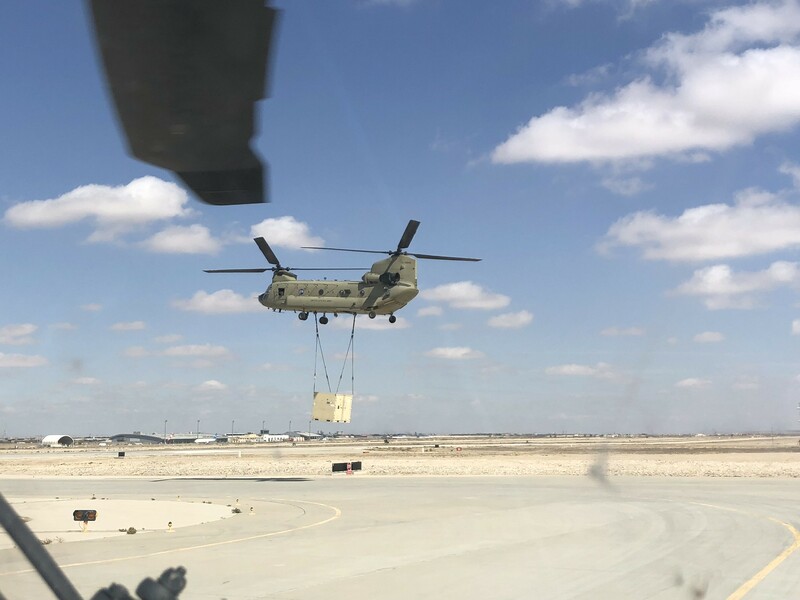 This is the "heavy lift" Chinook in action. Here is the amazingly scenic (???) country where they are working. These guys hang it all out for many Americans working in brutal conditions spread all over that sandbox! Please feel free to leave items in the colorful TSAC box just west of the entrance to King Soopers in Aspen Park. It is right next to the Blue Rhino propane bottle locker. Wonderful! You look so pleased and satisfied in this picture, my friend. I know how this endeavor feeds your soul. Grateful for TSAC and the community that supports it. We can, in a small way, each contribute to the moral of those who put themselves in harms way for us. Christmas cards this year??? If so, when do you need them?? If you would like to write some cards for the guys in this unit, please do!! by Nov. 15. Please leave them unsealed. Pinecammers are the best! Here is a "taste" of the latest from our TSAC supported troops in Afghanistan! The packages arrived today. Between the 2 that I got last week and the 6 from today I think that is the ones you sent. Once again, all very well received. The weather has started to get nasty so the warm beverage consumption is alive and well. We are still green on coffee and now very well taken care of on creamer. I am encouraging the guys to send the group some feedback I expect a few will for sure. One thing I know for certain is that all of them are thankful for the support. The crew members were lining their pockets with granola bars and nuts before going to fly tonight. [b]I just wanted to drop a quick note to express some of our appreciation for the packages you all have been sending. We received another six of them yesterday. Mike (our contact) gathers us around and, in his grandfatherly way, opens them up dramatically and distributes the goodies in a very Santa-esque manner. There is a decidedly sharp and palpable increase in morale whenever we get packages from you guys. Again, thanks for all you guys do for us. Thank you for the awesome packages that you have sent the Pachyderms of the 101st airborne division. While we are away from our families, it is wonderful to know that people are not only thinking of us, but going out and spending money and time for our comfort. You should know that it is much appreciated. I’m a CH-47 pilot with the Pachyderms and can speak to how much it positively affects the moral of the company when we receive your packages. Mike and his fellow pilots and crew members take what is more than they can use and "fairy dust" the excess to troops in remote outlying bases when they are on resupply missions. Many similar outbreaks of big smiles occur in those outposts thanks to you! My name is Adam (redacted), I’m currently on a deployment in Afghanistan with CW3 Brown. I just wanted to reach out to you to express my gratitude for all of the support provided by the Troop Support Action Committee. Your generosity is humbling and does not go unnoticed. Our team is at a relatively isolated camp where groceries and snacks are not readily accessible. Your care packages serve as a constant pick-me-up over here, keeping our moral high. We are proud to serve, but support from organizations like yours make us even more proud to be fighting for the American way of life. This kind of response from the troops out there really sends a warm fuzzy down our spines! Please feel free to put items in the TSAC box just west of the main door to King Soopers in Aspen Park. It is out by the Blue Rhino propane bottles. We pick items up and get them off to these brave folks. If you have more than you feel comfortable about putting in the TSAC box, please PM me and we can arrange a pickup directly! TSAC could NOT do this without it! TSAC got ANOTHER 9 boxes off to Afghanistan yesterday! Lots of goodies donated by folks just like you who really care to bring smiles and comfort to our brave troops! 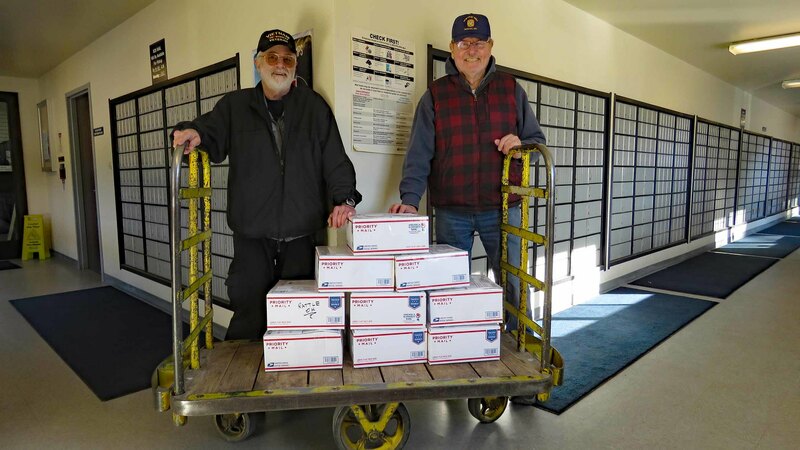 Here above is BGR (L) and RailBuf (R) with the boxes just about to go into the Bailey Post Office! We have plans to load up with new treats for our Chinook guys and some of the units in remote bases. We plan to use some of the recent generous cash donations at Costco for the best selection of energy bars and a few other recently requested items. For this time of year we will get makings for "warm" beverages to fend off the Afghanistan COLD winters. If you would like to use us to send comfort items to our troops, please feel free to put things in the TSAC box just west of the main door to King Soopers in Aspen Park. Please feel free to PM us if you have questions about the suitability of items to ship to Afghanistan. It has to fit into APO Flat Rate boxes which are 12x12x5.5 inches. TSAC is a Colorado Non-Profit Corporation. Thank you on this Veterans Day for thinking of our troops! Thank you for your service and how you continue to serve our brave active military. On Monday, 26 November, ANOTHER 8 boxes went off to Afghanistan! That's BGR standing in for Santa Claus. All of the items in these boxes came to TSAC courtesy of On The Move Fitness and their clients along with Pinecam's own RidinHy06. It is really exciting to be able to bring smiles on this order to our Chinook unit and others at remote bases supplied by the Chinook troops. Not one - but TWO "Charlie Brown Christmas Trees" with a few ornaments, strings of lights, and candy canes! Packets of "hot cocoa mix" for warm drinks. SEVEN "Cookie Tins" (which have a chance to travel there in acceptable condition) to spread Holiday cheer. Beef logs, beef summer sausage logs, hot beef sticks, and numerous bags of beef jerky! Tubs and boxes of powdered drink mix packets. Bags of toffee and other great candy items. Tubs of peanuts - the rectangular ones from Costco which fit nicely in Flat Rate boxes! Every corner of space in these boxes was stuffed with hot cocoa packets and wrapped candy. I am sure that we will get a number of responses from the "sandbox' and I will be sure to pass them along on the pages of this post. Thanks again to all who contributed to this bonanza! Stand by for the next report on more boxes going off THIS WEEK! BGR and ALL of TSAC!